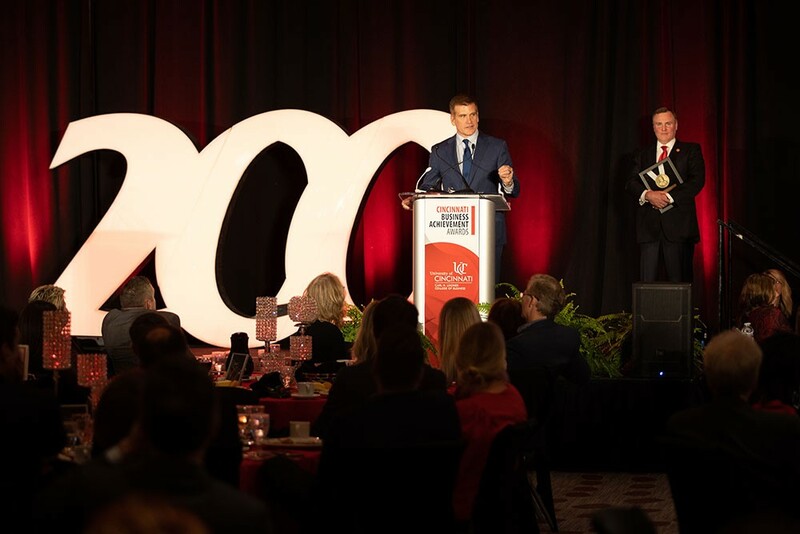 Presented by the Lindner College of Business Alumni Board of Governors, the program celebrated the accomplishments of individuals and business partners who have made a significant impact within the college, Greater Cincinnati region and the global business world. In his opening remarks, UC President Neville Pinto discussed the legacy of learning, innovation and achievement of the Lindner College of Business and thanked the business community for their support of the college and UC as a whole. At its core, the Lindner College of Business always has been, and always will be, focused on impact and innovation. Yet another highlight of the evening took place during the evening’s opening remarks by Interim Dean Nick Williams, who shared a recent example of how current Lindner students are carrying on the legacy of Carl H. Lindner Jr. Last year, Lindner Honors-PLUS student Mohamed Emlemdi ‘21 was informed by doctors that his kidneys were barely functioning. His diagnosis brought his usual life to a sudden and terrifying halt, as he was forced to spend nearly 15 hours a day on dialysis. When Mohamed's freshman roommate and fellow Lindner Honors-PLUS peer, Julian Litvak ’21, learned that his friend needed a kidney, he was tested and turned out to be a great match. In December, Julian donated his kidney to Mohamed — a remarkable gift that transformed both of their lives. 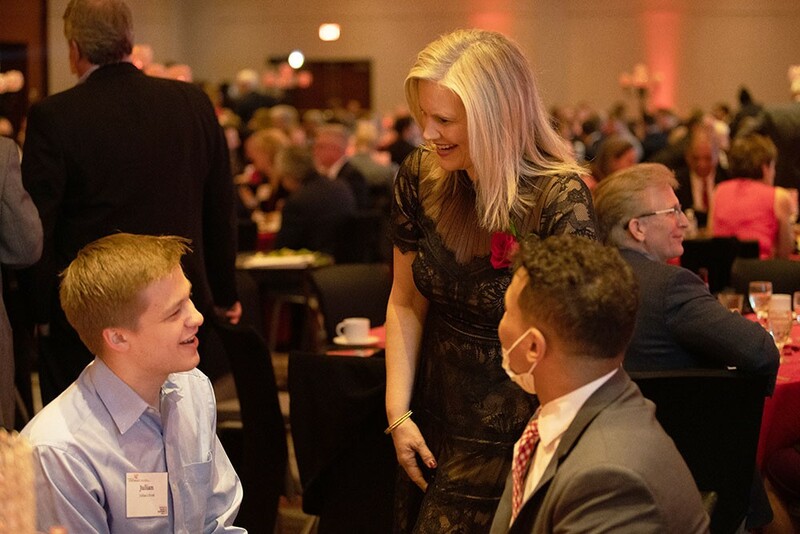 “Julian and Mohamed embody the spirit of giving that has always been a part of the Lindner family and the Greater Cincinnati community and set an inspiring example for all of us,” said Williams, as he gestured to the two young scholars who were honored with a standing ovation. Lori Beer (center) speaks with Lindner Honors-PLUS students Julian Litzak and Mohamed Emlemdi. Among this year's honorees, eight alumni, supporters, students and business partners were recognized for their contributions before a crowd of nearly 400. Kirk Perry, '90, president of Brand Solutions at Google and a longtime supporter of UC, received the college’s highest honor: The Carl H. Lindner Award for Outstanding Business Achievement. Kirk Perry, ’90, president of Brand Solutions at Google and a longtime supporter of UC, received the college’s highest honor: The Carl H. Lindner Award for Outstanding Business Achievement. The award, presented to him by his longtime friend and UC Trustee, Phil Collins ‘89, is given to a Lindner College of Business graduate who best exemplifies an entrepreneurial spirit with commitment to business, community and the highest level of success within one’s profession. Two Distinguished Service Awards were bestowed to Lori Beer, global chief information officer of JPMorgan Chase, and Laurence Jones ‘00, president of RiskVersity. Beer and Jones were recognized for their commitment to the college, UC and the community. Ameritas was honored with a Business Partnership Award for its strong support of the Lindner College of Business and local communities. This year’s recipient was hailed for participating in college networking events and career fairs, encouraging its employees to serve as guest speakers for business classes, and providing ongoing career opportunities for business students and graduates. Ameritas’ President, Steve Valerius ‘79, accepted the award on the company’s behalf. In recognition of alumni who personify Lindner’s PACE (professionalism, academics, character and engagement) ideals in their careers, two awards were given to Christina Beer ’15 and Makeda Matthews ‘14. Beer is the daughter of this year’s Distinguished Service Awardee, Lori Beer, and a Technical Program Manager for GE Aviation; and Matthews is a Sourcing Category Manager at Grange Insurance. As one of the oldest scholarships at UC that bears the Lindner name, this year’s Carl H. Lindner Outstanding Junior Scholarship was awarded to Angela Brown ’20 in recognition of her service to the UC and Cincinnati communities, as well as her involvement with Lindner’s Business Fellows and Circle of Excellence programs. Chandler Rankin ’20, a Kolodzik Business Scholar and Business Fellow, was honored with the Heart of William J. Keating Leadership Award for his service and student leadership in making UC a better place than it was when he first stepped foot on campus. Rankin shared how receiving this honor has rejuvenated his passion just past the midpoint of his college career. 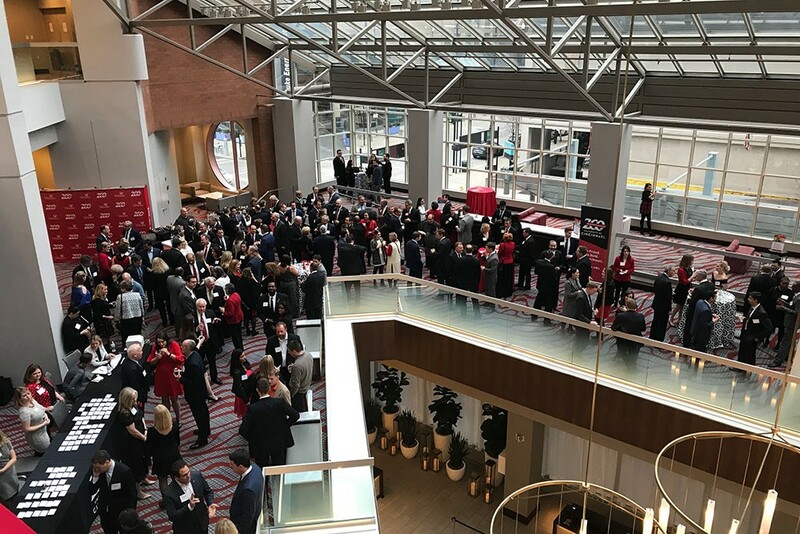 Nearly 400 of Cincinnati's business leaders and members of the Lindner community attended the 34th Annual Cincinnati Business Achievement Awards.